Abstract Trade-off analysis has become an increasingly important approach for evaluating system level outcomes of agricultural production and for prioritizing and targeting management interventions in multifunctional agricultural landscapes. We review the strengths and weakness of different techniques available for performing trade-off analysis. These techniques, including mathematical programming and participatory approaches, have developed substantially in recent years aided by mathematical advancement, increased computing power, and emerging insights into systems behaviour. The strengths and weaknesses of the different approaches are identified and discussed, and we make suggestions for a tiered approach for situations with different data availability. Trade-offs, by which we mean exchanges that occur as compromises, are ubiquitous when land is managed with multiple goals in mind. Trade-offs may become particularly acute when resources are constrained and when the goals of different stakeholders conflict (Giller et al. 2008 ). In agriculture, trade-offs between output indicators may arise at all hierarchical levels, from the crop (such as grain versus crop residue production), the animal (milk versus meat production), the field (grain production versus nitrate leaching and water quality), the farm (production of one crop versus another), to the landscape and above (agricultural production versus land for nature). An individual farmer may face trade-offs between maximizing production in the short term and ensuring sustainable production in the long term. Within landscapes, trade-offs may arise between different individuals for competing uses of land. Thus trade-offs exist both within agricultural systems, between agricultural and broader environmental or sociocultural objectives, across time and spatial scales, and between actors. Understanding the system dynamics that produce and change the nature of the trade-offs is central to achieving a sustainable and food secure future. In this chapter we focus on how the complex relationships between the management of farming systems and its consequences for production and the environment — here represented by greenhouse gas emissions — can be analysed and how trade-offs and possible synergies between output indicators can be quantified. For example, an important hypothesis is that by increasing soil carbon sequestration in agricultural systems, farmers can generate a significant share of the total emission reductions required in the next few decades to avoid catastrophic levels of climate change. At the same time, increasing soil carbon sequestration also increases soil organic matter, which is fundamental to improving the productivity and resilience of cropping and livestock production systems, and thereby a potential win–win situation is identified. However, it is debatable whether these win–win situations exist in reality. An important constraint for this hypothesis is the lack of organic matter like crop residues on many smallholder mixed crop–livestock systems, to serve both as feed for livestock and as an input into the soil in order to increase soil organic matter. This organic matter could be produced through the use of mineral fertilizer or intensification of livestock production, but both of these have negative consequences for greenhouse gas emissions, probably offsetting the gains made in soil organic matter storage. It therefore seems likely that to achieve maximum impact on smallholders’ food production and food security, environmental indicators have to be compromised. However, good quantitative insight into these compromises is still lacking. Trade-off analysis has emerged as one approach to assessing farming system dynamics from a multidimensional perspective. Although the concept of trade-offs and their opposite — synergies — lies at the heart of several current agricultural research for development initiatives (Vermeulen et al. 2011 ; DeFries and Rosenzweig 2010 ), methods to analyse trade-offs within agro-ecosystems and the wider landscape are nascent (Foley et al. 2011 ). We review the state of the art for trade-off analyses, highlighting important innovations and constraints, and discuss the strengths and weaknesses of the different approaches used in the current literature. Trade-offs are quantified through the analysis of system-level inputs and outputs such as crop production, household labour use, or environmental impacts such as greenhouse gas emissions. The outcomes that different actors may want to achieve, in and beyond the landscape, need to be defined at different time and spatial scales. Understanding these desired outcomes, or different stakeholders’ objectives, is a necessary first step in trade-off analysis. We illustrate the key concepts and processes of trade-off analysis with a simple example that has only two objectives: farm-scale production and an environmental impact, greenhouse gas emissions. Once the objectives have been defined, the next step is to identify meaningful indicators that describe these objectives. The indicators form the basis for characterizing the relationships between objectives (Fig. 10.1). The shape of the trade-off curve gives important information on the severity of the trade-off of interest. Is it simply a straight line, like the central curve (Fig. 10.1a)? Is the curve convex (i.e. the lower curve), which means strong trade-offs exist between the indicators); or concave (i.e. the upper curve), which means the indicators are independent of each other and the trade-offs between the indicators are quite ‘soft’? The shape of the trade-off curve represents different functional relationships and can be assessed by evaluating farm management options; in our example, each point could represent a method and level of mineral fertilizer application (Fig. 10.1b). The position of each option in the trade-off space describes its outcomes in terms of the two indicators, productivity and environmental impact. Based on this information, a ‘best’ trade-off curve can be drawn (Fig. 10.1c). In trade-off analyses the researcher will be interested in which system management interventions result in which type of outcome of the different objectives (Fig. 10.1d). Once the best (observed or inferred) trade-off curve has been identified, various system management interventions can be studied to assess the extent to which they contribute to the desired objectives (Fig. 10.1d). This analysis determines whether so-called ‘win–win’ solutions are possible, where the performance of the system can be improved with regard to both objectives. Alternatively, does improvement in one objective automatically lead to a decrease in system performance for another objective (Fig. 10.1e)? Possible threshold values can be identified once the shape of the trade-off curve is known. For example, do productivity thresholds exist, above which the environmental impact increases rapidly? In some situations, it may be possible to alter the nature of the trade-off between production and environmental impact through the exploration of new management interventions (Fig. 10.1f), thereby redefining the ‘best’ trade-off curve. Trade-offs are typically much more complex with more dimensions and objectives than indicated by the simple two-dimensional example presented in the previous section. A wide variety of tools and approaches have been developed to account for diverse situations. The most suitable approach depends on the nature and scale of the problem to be addressed, the trade-offs involved, and the indicators available. We assess five widely applied approaches: (1) participatory methods; (2) empirical analyses; (3) econometric tools; (4) optimization models and (5) simulation models. These five approaches overlap often and can help generate complementary knowledge. Consequently, trade-off analyses will often utilize several methods simultaneously or iteratively. The concept of participatory research originally highlighted the need for the active involvement of those who are the subject of research, or for whom the research may lead to outcome changes. In recent times, the notion has expanded to acknowledge that change in researchers’ assumptions and perceptions may be required to achieve desired outcomes that are attractive to farmers (Crane 2010 ). Participatory approaches, such as fuzzy cognitive mapping (Murungweni et al. 2011 ), resource flow mapping, games and role-playing, are powerful ways to identify actor-relevant objectives and indicators, although the scope of farmer knowledge and perceptions within scientific research can be constraining in some situations, particularly in times of rapid change (Van Asten et al. 2009 ). 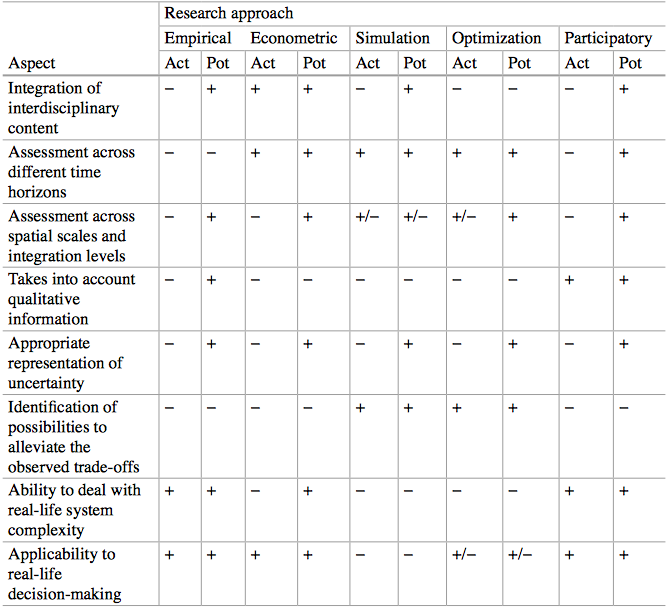 There are many examples of participatory approaches (Gonsalves 2013 ) that could be or are used to assess trade-offs. Participatory approaches usually generate qualitative data and so, although they may not be well suited for quantifying trade-offs, they provide critically important information to support quantitative tools, for example through the development of participatory scenarios (DeFries and Rosenzweig 2010 ; Claessens et al. 2012 ). However, despite the participatory nature of these approaches, the assessment of trade-offs often remains researcher-driven. Quantitative assessment of trade-offs requires empirical or experimental approaches to generate data on the behaviour of the system under different conditions. Trade-off curves can be drawn on the basis of experimental measurements of indicators, such as the removal of plant biomass for fodder and the resulting soil cover, which is a good proxy for control of soil erosion (Naudin et al. 2012 ). Statistical techniques such as data envelope analysis (Fraser and Cordina 1999 ) or boundary line analysis (Fermont et al. 2009 ) can be used to quantify best possible trade-offs between indicators in empirical datasets (e.g. Fig 1c). Related to these empirical approaches are econometric tools: these use large datasets as the basis of statistical coefficients that define the input–output relationships of system level outcomes (e.g. Antle and Capalbo 2001 ). Developments combine biophysical and socioeconomic aspects of the system, and use farm–level responses to quantify consequences at a regional level (Antle and Stoorvogel 2006 ). Empirical and econometric approaches are powerful in the sense that outcomes of various system choices can be explored using the existing variability in system configuration and performance. However, the inference space of the analysis is constrained to the dataset collected and is therefore not suitable for predicting outcomes outside the ranges of the original data. Empirical approaches cannot be used to assess indicators that are difficult to measure directly; therefore, they are often combined with simulation models to obtain an overview of overall system performance. Simulation models allow the dynamic nature of trade-offs to be explored, where outcomes can differ in the short or long term (Zingore et al. 2009 ). System performance, expressed quantitatively in terms of outcomes represented by different indicators, can be used as an input for optimization approaches such as mathematical programming (MP). MP finds the best possible trade-off through multicriteria analysis and can assess whether this trade-off curve can be alleviated through new interventions. MP has a long history (e.g. Hazell and Norton 1986 ) and is among the most extensively used trade-off application in land use studies (e.g. Janssen and Van Ittersum 2007 ). This is despite its inherent limitation, that land users do not always behave according to economic rationality and optimize their behaviour. Techniques have been developed recently to solve non-linear MP problems and integrate across levels, linking farms and regions through markets and environmental feedbacks (e.g. Laborte et al. 2007 ; Roetter et al. 2007 ; Louhichi et al. 2010 ). Inverse modelling techniques use non-linear simulation models directly to perform multiobjective optimization without the intermediate step of MP. Furthermore, with the identification of the appropriate model outputs, system behaviour can be assessed across different temporal and spatial scales and feedbacks taken into account, which is often a weak part of MP models. The complexity of agro-ecosystems and the large number of potential indicators can hamper efficient applications of this computationally intensive method. But advances in computer power have resulted in several applications in farming systems research, going from farm to landscape (Groot et al. 2012 ; Groot et al. 2007 ; Tittonell et al. 2007 ). The various approaches to trade-off analysis each have key strengths and weaknesses and combining approaches may provide enhanced opportunities for a realistic, relevant and integrated assessment of systems (Table 1). For example, in many cases participatory approaches are needed to define meaningful objectives and indicators, but are not suitable to reliably quantify the trade-offs associated with possible interventions. Empirical and econometric approaches can be used to quantify the current state of the overall agricultural system. In many cases, however, simulation models are needed to quantify indicators that are difficult to measure (for example, effects of management on longer term productivity) and to explore options beyond the existing system configurations and boundaries (Table 1). Optimization can used to assess the potential for synergies and alleviation of trade-offs, but has limited applicability when sociocultural traditions and rules play a key role (Thornton et al. 2006 ). It is clear that for trade-off analyses combinations of techniques are needed. Multicriteria analysis is an example of such an integrated approach, in which participatory and optimization methods are combined: the weighting of the individual criteria in goal programming models is done together with the stakeholders, and by changing these weights with the stakeholders a trade-off analysis is performed (e.g. Romero and Rehman 2003 ). The discussion above demonstrates that for fully integrated trade-off analyses different approaches should be combined. However, in many cases data availability will not allow such elaborate analyses. The techniques discussed in the previous section not only have different strengths and weaknesses, but also different data demands. Typically, empirical and econometric approaches are highly data demanding, whereas participatory approaches can provide essential information about system functioning after only a few well–designed discussion panels and targeted questionnaires. Simulation and optimization models can be, in terms of data demand, anywhere between these extremes. Their data demand is highly determined by model setup and complexity. An example of a tiered approach in which researchers move from quick initial data analyses to more complex, data demanding, modelling exercises is the four step approach used by Van Noordwijk and his team at ICRAF (Meine van Noordwijk, personal communication; see also Tata et al. 2014  for the first three steps; Villamor et al (2014)  for an agent–based modelling approach). Step 1 is the collection of system characterization data and the analysis of these data to explore whether trade-offs can be identified, for example between an environmental indicator like soil carbon and the net present value of the land. The second step is to look at these variables from a dynamic perspective and identify opportunities for interventions by analysing the opportunity costs of different management options. This step already requires much more detailed data than step 1, and in the example above, could be used to identify the price of emission reduction potentials. In the third step, the consequences of the identified intervention options for the different land users and the environment can be explored by using dynamic land–use models. Finally in the fourth step, agent–based models and participatory modelling exercises are used to analyse the opinions of, and interactions between, different actors in the landscape. This provides an integrated analysis of both the environmental and socioeconomic factors and actors within the landscape. This four–step approach demonstrates the way in which the strengths of different methods of trade-off analysis can be combined, and how such an analysis can move stepwise towards more complex and data-demanding exercises. All in all it is not straightforward to give concrete advice that relates the purpose of analysis to the technique and approach to be used. Researchers make personal choices about complexity and analytical approach as part of the ‘art’ of modelling and trade off analyses. This is sometimes difficult to reconcile with the ‘objectivity’ that we pursue in scientific research. However, some general indications can be given. If the objective of the analysis is to assess the overall potential for system improvement and the room for manoeuvre to increase efficiencies and profitability without negative effects on environmental indicators, then optimization approaches are the most logical choice. If the purpose is to analyse the short– and long–term consequences of certain interventions and the trade-offs between different objectives over different time scales, then simulation modelling is an obvious candidate. This may be combined with some sort of multiobjective, non-linear optimization or inverse modelling approach. Both optimization and simulation are typically used for scientifically oriented studies. In order to have real-life impact, that takes into account the complexities of agricultural systems and the large diversity of drivers and options in agricultural land use, especially in developing countries, a variety of quantitative and qualitative approaches are likely to be needed (e.g. Murungweni et al. 2011 ). The setup of these tools, the identification of indicators, and the presentation of results need to be determined using participatory approaches where key stakeholders are involved and drive decisions from the beginning of the project. This might lead to the study having less value in terms of scientific novelty, but will increase its practical relevance on the ground. With the topic of this chapter in mind, it is ironic that in many cases there might be a trade-off between the scientific and societal impact that can be achieved by a research project that has its own constraints in terms of time and money. This study is an outcome of a workshop entitled ‘Analysis of Trade-offs in Agricultural Systems’ organized at Wageningen University, February 2013. We thank all participants for their discussions, which contributed strongly to the content of this chapter. The workshop and subsequent work were funded by the CGIAR Research Program on Climate Change, Agriculture and Food Security (CCAFS), Theme 4.2: Integration for Decision-Making – Data and Tools for Analysis and Planning. This chapter is a modified and extended version of Klapwijk et al. (2014) .